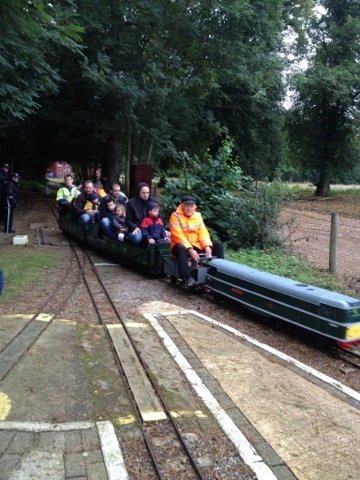 Great wee trip on Sunday when we spent an hour or two with the Rugby and Rainsbrook engineering society taking young Edward for a ride on the trains. When our children were little these scale model trains used to ride past the fence in our back garden when we lived in Rainsbrook Avenue. Kerry, Laura and Scott used to wave to the passengers as they passed by. 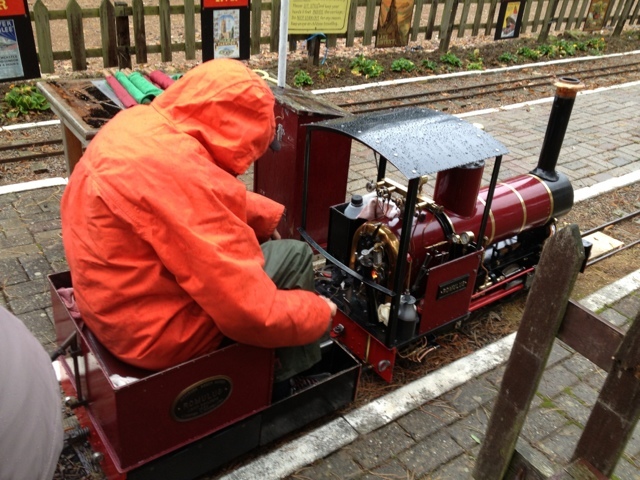 Some 24 years ago the trains moved to a permanent site on the Barby Road, where the members have built a fantastic scale railway on which to run their model trains. 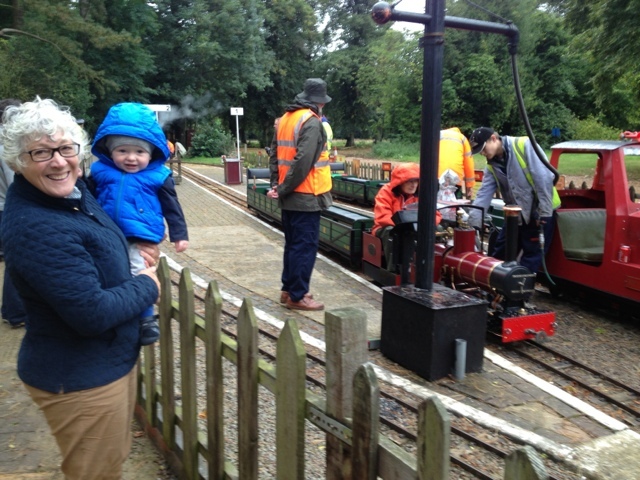 Since then we asa a family have had no need of such fun but now we are grandparents the circle turns again and so we set off to enjoy their open day on Sunday with young Edward Lord . It was a treat and the site is a real tribute to the members enthusiasm, its huge and due to be expanded next year. This is the stuff that puts the Great back in Britain and long may the members keep on travelling on their wee trains enjoying their all consuming passion. Thanks for sharing boys and girls and keep on steaming! 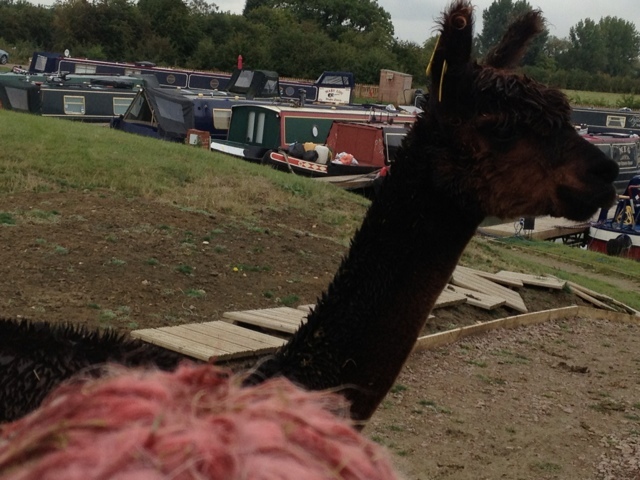 Who said you can't keep an alpaca on a canal boat? Well if you have your barge moored at the canal marina at Barby in Warwickshire you can. 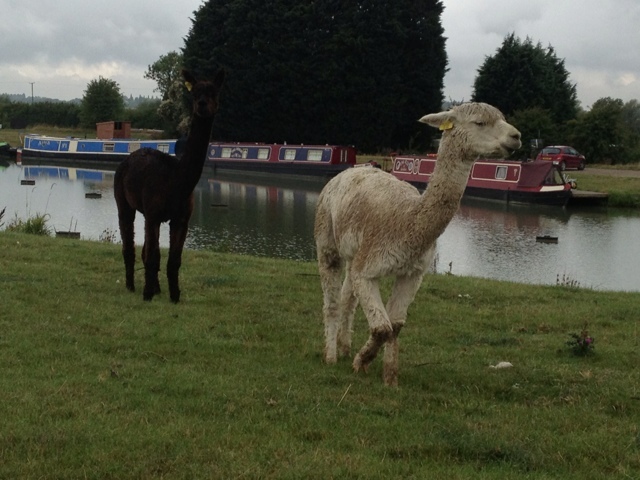 This morning we delivered three pet alpaca males to the canal basin where they have huge island in the middle of the Marina which has been traditionally grazed by sheep. 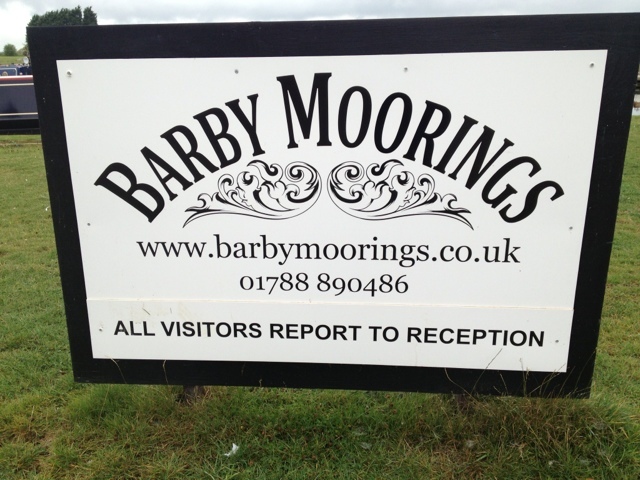 The owners and creators of Barby Moorings -Tony, Penny and Luke have decided on a change and replaced the sheep with alpacas. Here are the pet alpacas taking in their new surroundings on the island which is the highest point in the Marina so has plenty of wee hills upon which to play 'I'm the king of the castle'. These three pet alpaca males will be the stars of the show at the weekend when all the bargees arrive. As it was there were boat owners asking lots of questions as we were leaving. I did warn young Luke that the work might slow down for a while until the bargees familiarise themselves with the new attraction. If you don't want to talk to the people then don't buy alpacas!! 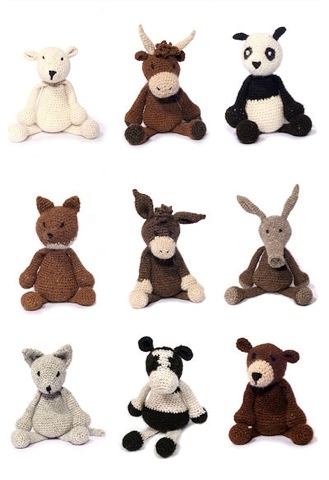 It's been a long time coming but Edwards Menagerie of crochet animals has now been published and is available online from the TOFT Shop. Kerry started creating this collection in the last few weeks of pregnancy whilst awaiting Edwards arrival, as you do. 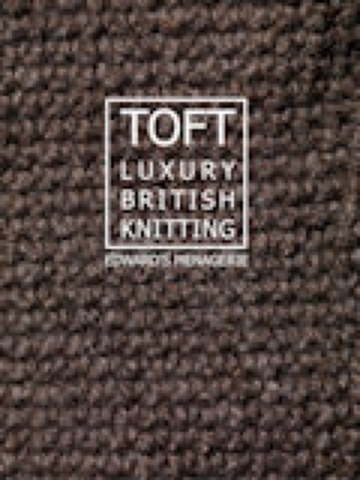 Since then she has spent a whole year refining the designs, checking the patterns and adding to the menagerie to produce this magnificent and very original TOFT collection. She launched the finished article yesterday at the same time we gathered to celebrate Edwards first birthday. timely and very apt. 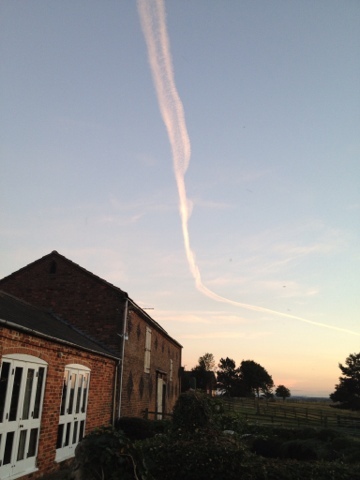 Well done Mummy! What an achievement! Well done Kerry we are immensely proud of the work you do in the studio but this has been a monumental effort which we have all lived with for a long time but the finished product is truly beautiful and something that will bring joy to all who take on the challenges within. The result has been well worth your efforts and is a tribute to your creativity- this truly stunning e- book is stylish, modern and extremely attractive. With patterns and projects for all levels of creator it is no wonder that this e-book is flying out of the shop across the world faster than the swallows can return home. 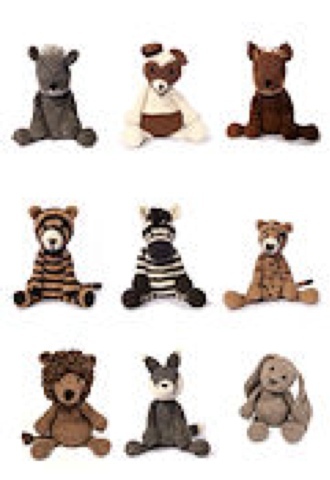 I kid you not folks get on it now, get yours and get making, Edwards Menagerie is on the move! Well done Kerry Lord and all her staff and helpers in the TOFT studio. You got it in one. 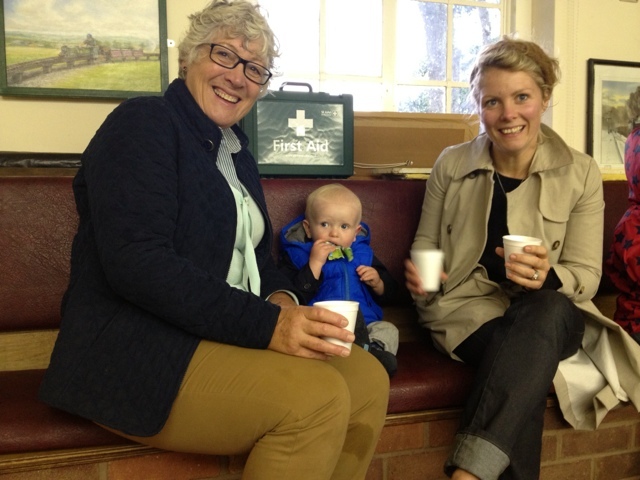 Edward Lord was one year old and we had a bit of a do for him in the Toft Alpaca Studio. Jelly and cakes and dips with balloons and pressies. 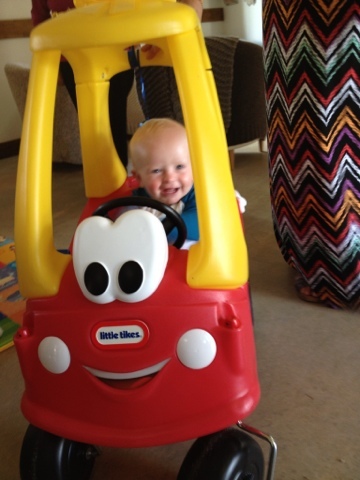 The star of the show being a wee push along car bought by Auntie Sandra and preassembled by Uncle Keith (a stroke of genius that move) which the boyo wouldn't get out of! 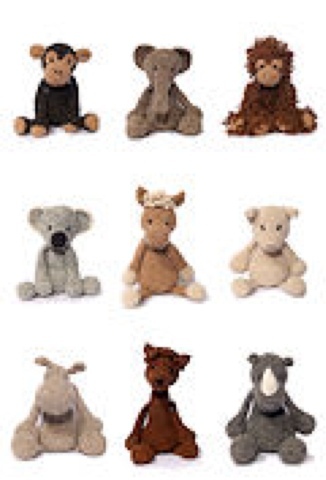 He was trundled up and down the Studio by his Rellies and friends until their arms ached. He waved at the passersby, honked his horn by banging his head on it and occasionally stopped and opened the door for bystanders to invite them to join him. 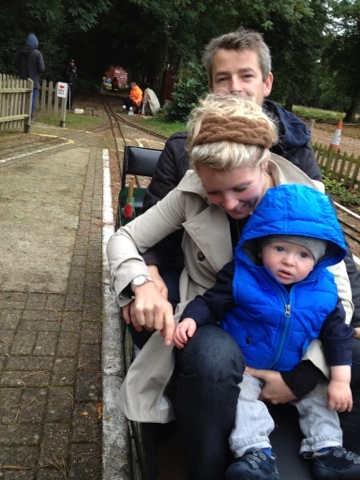 Blissfully unaware that its a one seat only job. When they declined his offer, he closed the door, turned his blue ignition key on and trundled off with a wave goodbye. 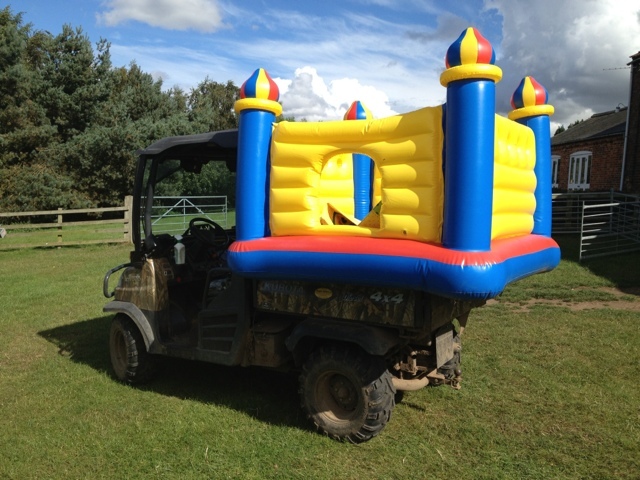 Noddy never had so much fun. 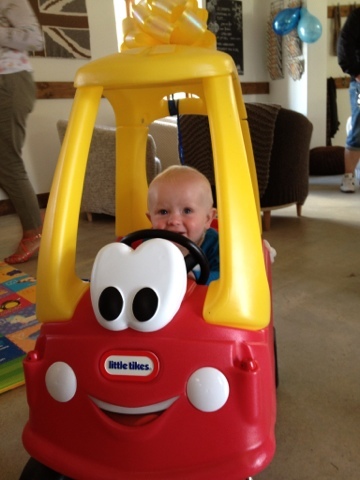 He grinned the whole time and enthralled us all with his driving antics- Lewis Hamilton watch this space. 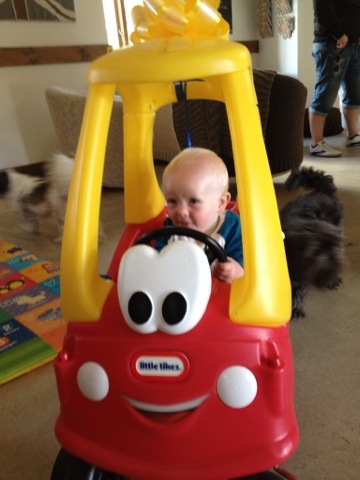 Congratulations little big man on a wonderful and joyous year. Dandad and Danma can't wait for the next instalment. Big alpaca day last Saturday which saw Shirley and I up at the crack of sparrows and skidding down to Bozedown Alpacas for the 2013 Alpaca Classic, where Bozedown Alpacas and the Alpaca Stud were holding an alpaca weekend of talks focused around an auction of elite alpacas from each of their herds. 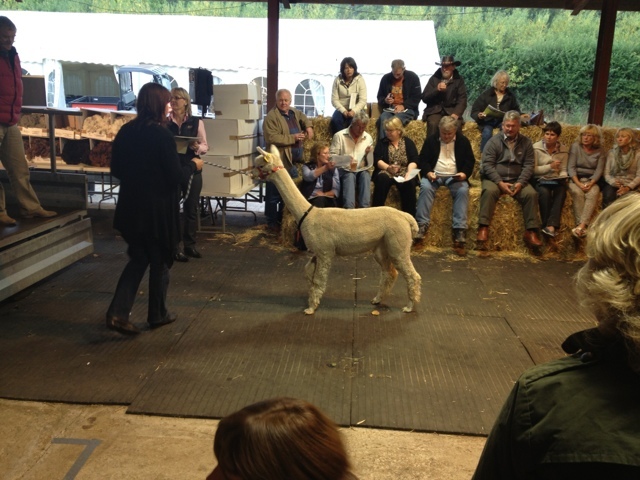 So an interesting alpaca day out of talks and gee up leading towards an auction at 5pm. 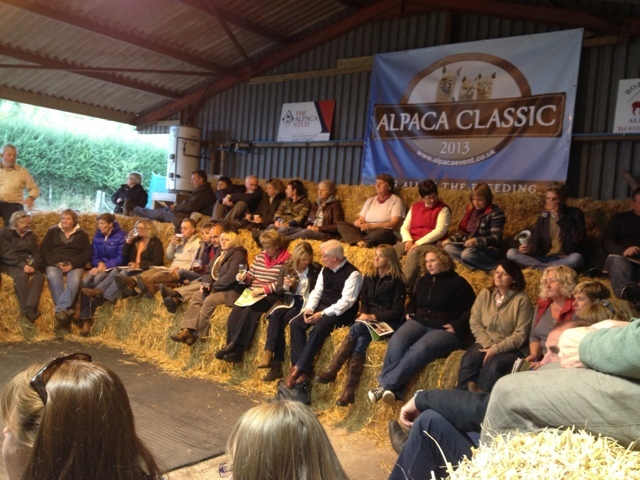 Brett Kayson from Alpaca Penn Sales gave two talks and insight to the Alpaca industry in the USA. AOBA judge Cheryl Gerhly from the USA gave a talk on the significance of crimp and Claire Whitehead from Camelid Vet Services gave a talk on alpaca Embryo transfer introducing this new service she is offering UK breeders. 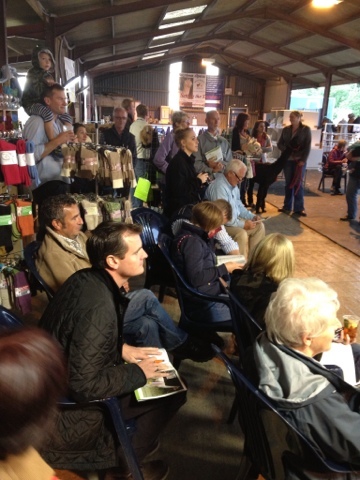 All culminating in the auction where 26 elite lots were auctioned by both herds. 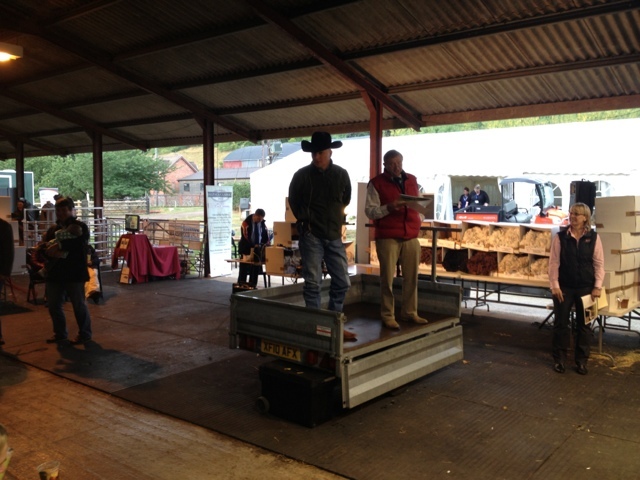 The auction being run by Harrison & Hetherington from Cumbria. Bidding was strong for the most part 17 lots made their reserve and were sold for realistic prices making the average price per lot sold around 6782 Guineas by my reckoning. 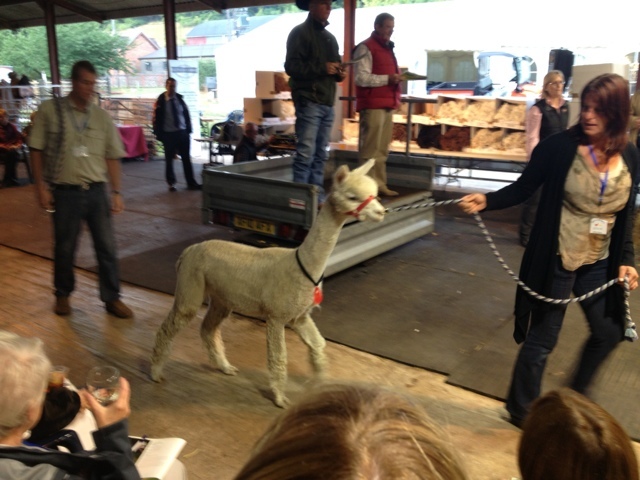 Congratulations to Bozedown Alpacas and The Alpaca Stud for organising this elite showcase, creating a real friendly atmosphere and making it such a successful Alpaca event.